Protests are planned outside the White House in Washington, D.C., and at several locations across the U.S. on Thursday evening to object to leaks that the U.S. Federal Communications Commission is considering a new “hybrid” proposal to break through the deadlock over net neutrality rules. Taking a cue from recent protests in Hungary against an Internet tax, the demonstrators plan to hold their mobile phones, laptops, tablets and flashlights above their heads as a symbol of protest to “shine light” on alleged corruption in the federal government. By the reclassification, back-end broadband services, through which broadband providers serve as a route for Web sites to distribute content, would be classified as a common carrier under Title II of the Communications Act and brought under the FCC’s authority, according to the report. Retail services provided to consumers by Internet service providers would not come under the reclassification. In September, net neutrality groups and companies observed Internet Slowdown Day with thousands of websites participating by showing spinning-wheel icons to mimic slow-loading sites. 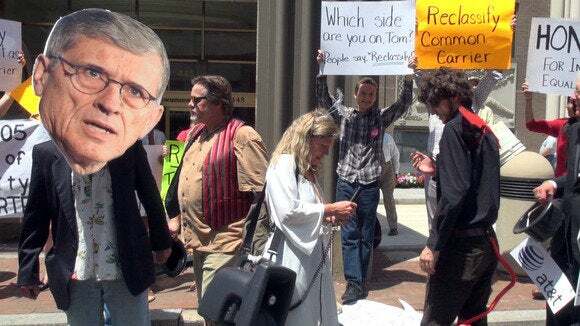 The aim of the protest was to convey to visitors the Internet slow lanes activists claim will appear if the FCC doesn’t pass strong net neutrality regulations. The protests on Thursday will include demonstrations at San Francisco’s Civic Center Plaza, Federal Plaza in Chicago and at the Philadelphia headquarters of cable company Comcast, according to PopularResistance.org. Supporters who can’t make it to the event are asked to take a photo of themselves holding a sign that says #RealNetNeutrality or #ReclassifyTheInternet and upload the snap to the Tell the FCC - My Voice Matters! page, according to Free Press.